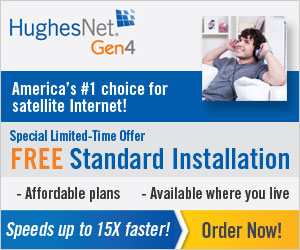 HughesNet is a satellite-based Internet service provider that is part of Hughes Communications, Inc. The corporation was founded in 1971 in Maryland, and went through multiple buyouts and acquisitions before becoming its own separate company in 2006. Hughes Communications Inc. is currently a subsidy of Echostar Corp. after an acquisition in 2011. The HughesNet brand offers satellite Internet access in American and Europe for both private individuals and businesses. In 2016, the FCC declared that HughesNet was the number one provider in the United States for delivering service at the speeds they advertise. This has naturally made them a very popular Internet service provider. With their top plan, the Power MAX plan, users can reliably get 15 Mbps downloads, which is quite a bit faster than most other satellite Internet providers can offer. Even HughesNet’s more affordable packages offer 10 Mbps, which is more than fast enough for average amounts of streaming, surfing, and downloading from the Internet. While the speeds are fast, HughesNet doesn’t offer quite as much bandwidth as other satellite Internet providers. Their basic plan includes only 5 GB of anytime bandwidth, which is just under industry averages. Their premium plans offer as much as 60 GB per month of anytime bandwidth, with access to 50 GB of off-peak bandwidth (these times usually occur between two and eight in the morning). Users can purchase additional bandwidth for higher fees. 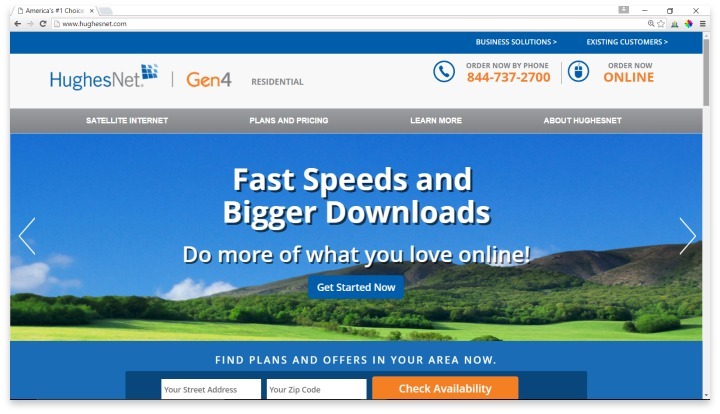 HughesNet offers a variety of other services for their customers besides fast Internet. Users have access to an “Express Repair” service, which offers 24/7 access to a phone support line, and the ability to have a repair technician come to your house the very next day. This service does cost extra. Users also receive spam protection, virus protection, bandwidth monitoring, and integrated browser tools for bloggers. HughesNet requires that all customers enter into a two-year contract. The early termination fee can be hefty depending upon how much time you have left on your contract (from $200 to up to $800), but they offer quite a few plans to choose from; users who need to save money can downgrade to a different plan without a penalty. There is also a “vacation plan”, which allows users who travel often to pay less during the months when they are not at home. Customer service can be reached through the website, through email, or via telephone. They don’t offer any bundled services for TV or phone service, like many other Internet providers, and their bandwidth restrictions mean that their services are not suitable for gamers or consumers who work from home and require constant Internet connection. Their prices range from $40 to $130 per month, with an additional $10 per month lease fee for the equipment. They do not require any installation fees or set up fees, however. HughesNet offers fast Internet, express repair service and 24/7 access to a phone support line. For the average consumer who wants to stream a few movies and stay connected to the news and social media, HughesNet is a great option for Internet. The basic package is very affordable, and offers enough speed and bandwidth to serve average Internet usage needs. The good customer service options and relevant extra features make HughesNet even more valuable. For those who want to save money by keeping all their connection services bundled, or for those who use more than average amounts of bandwidth, HughesNet probably doesn’t offer the connectivity you need. Have you had an experience with this company? Please share your HughesNet reviews below.